The Good Analyst is a new book about how a better understanding of social value can create a new set of relationships between society, money, and people’s access to an ok life. Money can be difficult to move around in society — getting stuck sometimes in the wrong places, or being imagined to be somewhere where it turns out later it’s not (or not any more). In the social sector these difficulties are often compounded by money not really knowing where to go, or how to be effective. But there is a potential lead. As the sector is really about impact — meaning the social or environmental good that comes from somebody doing something — by looking at impact, it is possible to send signals to money as to how to move. And so put more distinctly, the book is about how analysing social impact can inform and guide the flow of capital through the social-purpose universe to the places where it can do most good. 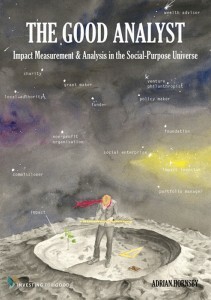 The Good Analyst presents a methodology for impact analysis, along with a set of guidelines for measurement. But any act of analysis is dealing with two kinds of information: firstly and most obviously, information relating to the object under analysis; but also, though often in more coded form, information about the person performing the analysis, and how they think. A methodology deflects some of this away from the individual analyst, but it rapidly falls back on the methodology itself, embedded within which will be the assumptions and opinions of whoever devised it. To be transparent on this front, as no doubt my philosophy has shaped both the methodology and the results it produces, the book opens with an outline of where it has come from in terms of the ideas, beliefs, and perhaps most importantly of all, the aspirations as to what it can do. A good analyst, for the purposes of this book, is one who analyses social and environmental good, as well as one who does so well or skilfully, and is in this sense good at doing it. But there is a third meaning too, as like a good Samaritan or a good witch, a good analyst can I believe be a force for good, with a moral power and a social impact all their own. To grow impact and, as a society, to invest in it, we need to know where and how it is taking place. The genius of the good analyst is in finding this knowledge out. DOWNLOAD THE EBOOK — FOR FREE! This entry was posted in KMZ Features, Thoughts and ideas. Bookmark the permalink.